Who is involved during your PhD? Download the full overview here. The relationship between you and your supervisor determines the experience of transferring the knowledge and skills leading to a doctorate. You will develop a research oriented mind-set through interaction with your supervisory team. Therefore TU Delft Graduate School puts great emphasis on the responsibility the supervisor has in guiding the doctoral candidate. The team may include additional researchers or educators, for example in case of collaboration between departments, faculties or organisations. Preferably, the supervisory team provides both junior and senior research and PhD coaching expertise. in agreement with the PhD candidate. The Faculty Graduate School appoints a mentor to each PhD candidate. 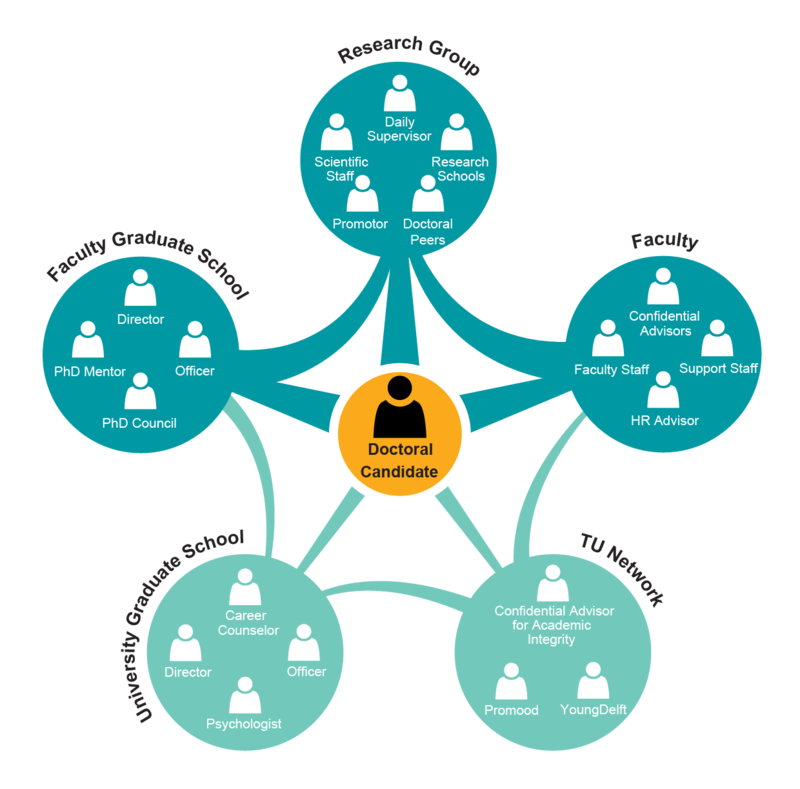 To refer the PhD candidate to other relevant people within the organisation. For more information contact your faculty Graduate School. PhD candidates are also welcome to join TU Delft Career Centre activities that are open to students. A Licenced Psychologist, Drs. Paula C.M. Meesters, is available for all TU Delft PhD candidates. The focus is on short term support and treatment for all kinds of personal issues or experienced difficulties in the PhD research process. All contacts are strictly confidential. Paula also teaches four courses on Personal Development and Effectiveness within the Doctoral Education (DE) programme: Communication and Coping Strategies, Self-management, Regain your flow (Motivation) and Autonomy in the research process. Interview with supervisor Fulvio Scarano (Head of AWEP department, Faculty AE). I found out that doing a PhD is not all about doing research, there are also other challenges to cope with and learn from. Career tips from Career counsellor Margaret Welten (TU Delft).